El Gamso to Ponferrada 42 km. Early on in Walden, Thoreau says, “It is true, I never assisted the sun materially in his rising, but, doubt not, it was of the last importance only to be present at it.” ( I recall my son Charlie once saying that was his favorite line). 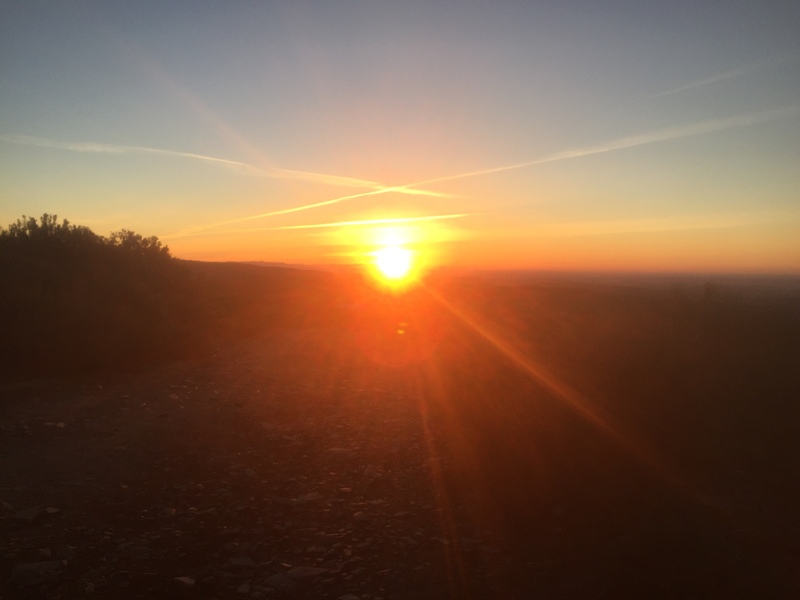 Thoreau’s sentiment is also shared by my friend Gloria who last night proposed we get up early and hike to the ridge near Cruz de Ferro to watch the sunrise– a walk of 15 km including a long steep climb. At 4:00 am, Gloria, Rudy and I were up and in a few minutes were hiking fast and hard down the path, headlamps dimly lighting the way. The sky was awash with stars, the Milky Way streaming through the middle, punctuated by the occasional meteorite. But the sky had to be ignored most of the time as we had less than 3 hours to cover the distance. Before long a crescent moon rose at our backs, making it a most celestial day. Setting a brisk pace we made the first landmark (the next town) in good time, but Rudy soon had some shin pain, opting to stop a while to rest while Gloria and I pressed on, now climbing the ridge in mud and water while the horizon began to lighten ominously. Soon anticipation gave way to near despair. Pushing on through the just-waking village of Foncebadon, we crested the main ridge, still short of Cruz de Ferre, but with the ideal place to see the morning in. The sleeping pad I’ve been carrying all year finally got some use on the Camino, the perfect cushion to rest and watch the show, and what a show it was. Some low clouds ran interference as the orange intensified, then a brilliant intensity of yellow light turned my retinas purple, but the sun’s rays soon touched all around and, though we had not materially assisted in its rising, we had contributed our mite, and gotten everything in return. It’s a strange feeling to have been up and toiling long and hard only then to recognize that a new day has commenced. 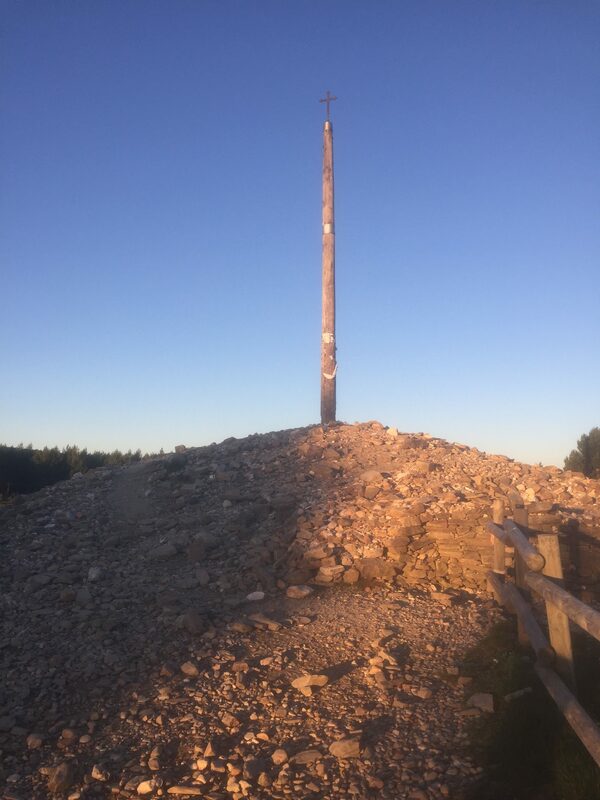 We got up, stretched, and made our way to the Cruz de Ferre, an iron cross atop a tall wooden pole surrounded by a huge pile of rocks brought from all over the world. I found a rock by the path and pitched it over my head onto the pile, while Gloria retrieved the one she had carried from some far away place in anticipation of the moment. The rest of the morning and early afternoon was a roller coaster of ridges, each bringing us closer to a new landscape and climate. The world was transformed. 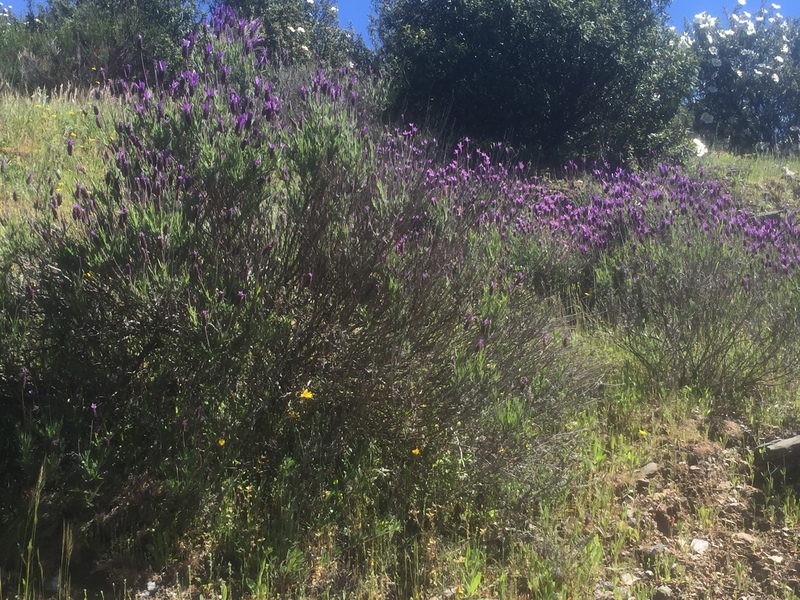 Huge oak trees, many small streams, and an efflorescence of wildflowers changed what had been for so many days dreary flat fields. We walked through color– more color than you can imagine. Lavender, daisies, buttercups–only the beginning of the palette. The towns began to change as well. Terra cotta roofs gave way to slate; the houses crowded the street with heavy-timber cantilevered second story porches shading the way. On the way to the valley floor to Ponferrada, we passed villages choked with wisteria and amazing old woodwork. Stopped for lunch at Molinaseca, a town with a Roman arched bridge across a river flowing past an inviting cafe. Since mayday had fallen on Sunday (yesterday), the holiday was today so the patio was soon flooded with families enjoying their day. After already hiking 35 km, it was with real reluctance that I finished my iberica ham and melon lunch and shouldered the bag for the last 7 km–such is the pilgrim life. On the way into the city, Rudy rejoined us, so we found the Albergue, had a paella dinner, and slept the sleep of the dead. If ever a day was carpe diemed, it was this one.